When I say op shop, I'm not talking about an antique shop or retro store or somewhere that will charge you an arm and a leg for really old clothes and rusty tins. I mean the good old fashioned op shops, where you can find piles of books at 50 cents each, designer label jeans for under $10, kooky knitted jumpers and all sorts of weird and wonderful but useful stuff for less than the change in your wallet. These stores are usually huge and packed with everything from clothing and shoes to furniture, books and kitchenware. The best I've found is in Woolongabba, at 779 Stanley Street. It has all of the above in spades and is really cheap. If you can find a massive Salvo's Store, like the one in Red Hill at 80 Glenrosa Road, then you'll find plenty of bargains. The store I've mentioned does try to be a little fancy and some of the prices for knick knacks and bits and pieces that they think are 'antiquey' are laughable (but still cheaper than actual antique shops). 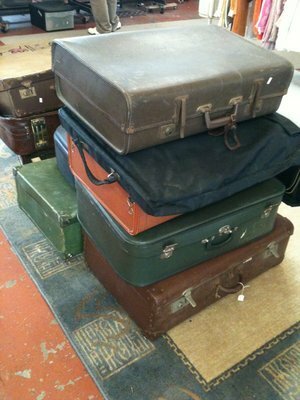 They always have old suitcases and picture frames and a shed full of furniture as well as stacks and stacks of clothes, all sorted into categories for easy browsing, and homewares. A group of op shops in one place can be just as good as a super store, though you probably won't find furniture or other large items. Annerley has several on Ipswich Road between Dudley and Warwick Streets. There is a Lifeline, an Aid for the Blind store and an Asthma Foundation store, all of which have lots of clothes and books and often have the fantastic 'fill a bag for $2' sales. Well, those are my tips for where to do some happy op shopping but what about yours? What fantastic finds have you picked up and where? 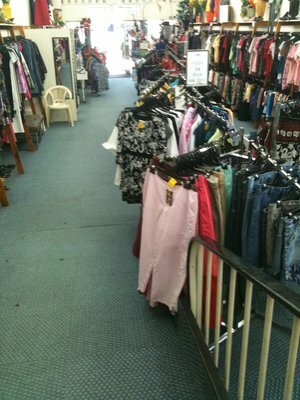 Wynnum has a great selection of op shops. My top pick is The Box, which is down an alleyway on Bay Terrace. It's this tiny room full of stuff that you really have to rummage through, but the prices are ridiculously low (e.g. on my last trip I got a green glass candy dish for 20c). Good old fashioned op shopping. The Thrift Shop and Eternity Boutique on Windsor Road at Red Hill. Open 6 days a week, the clothes in the Eternity Boutique are in great condition, with some solid brand names and at prices lower than I've seen anywhere. Priceless House, 34 wellington road woolloongabba!! In the Redlands, you cant go past The Thrift Shop and The Salvation Army on Redland Bay Road Capalaba, still selling items at True Op Shop Prices. The Salvation Army store on Shore Street West at Cleveland is very good on quality and price as well. ASTHMA FOUNDATION OP SHOP COORPAROO is open 7 days a week on Cavendish Rd near Coorparoo train station. 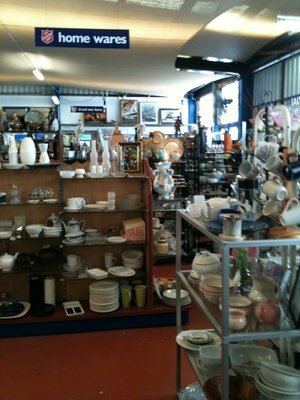 The shop is huge & they have a huge range of items, prices are good including well priced furniture & most things are new or near new. Everything is clean & the shop smells fresh. The shop is set out really nicely & I find it easy to spend a couple hours in there just looking at everything. The staff are very happy too!! I love going to the tip shops in Geebung and Acacia Ridge. You'll find all kinds of stuff there and all ridiculously cheap! Womens & Mens clothing 4 for $10. Also Tables with fill-a-bag for $1 & $2. Red Cross Op Shop in McWhirters Fortitude Valley is open on Sundays from 9am - 3pm and it's MARK DOWN DAY. I love this store so much that now I'm a volunteer on Sunday afternoons. I still can't believe I can buy clothes from $1 and they have Label clothing from $10. Some items including jewellery and handbags are new. It's right on the Brunswick Mall so come and say hi and check us out. The shops next to the Geebung Railway Station currently have four op shops within a block - three on Newman Road and one on Robertson Road. There is a Lifeline, an Aid for the Blind store, a Salvos, with the last of the four being (I think) a Red Cross store. All are well worth a visit. Vinnies at the Valley (Brunswick Street) Red Cross at McWhirters The Salvos at Lutwyche thyese are my top 3 but did find a new one that's pretty good for all round bargains on Newmarket Rd All these Op Shops have good value items and friendly staff. Capalaba. Start at Noeleen St, Endeavour and Footprints. Footprints has been my favourite for many years. Lots of treasures to be found. Endeavour is wonderful , and their books are sorted by Author which makes it easier when looking for a particular book. Across from the car park is a small Lifeline. Then go along Redland Bay Road a few blocks to a Lifeline Supastore and a little further a Salvos Store. Turn back and near the cnr of Old Cleveland and Moreton Bay Roads is a Vinnies. Also while you are at Capalaba check out the Golden Circle and Sara Lee stores for groceries, and the Drink Depot for lots of soft drinks brands you don't see at the supermarkets. Always check your local paper for Church Bazaars. Several Churches at Clevleand have regular jumble sales on a saturday morning, they are listed in the Redland Times on a friday. Love a good church oppie...they still price used goods the way they ought to be priced, not like many so-called op shops who like to think the sign out the front of their store says "antiques and collectables" and price things way out of the league of those in the community who really need them. Check out Bridgemans Downs Baptist for their once a year garage sale...it's amazing. the salvation army in redhill on glenrosa rd. My davourite at moment. Massive. Colour coordinated all the homeware and decor items. must go to. Lots of furniture also. Great prices. Lifeline Supa Store at Virginia usually has at least one thing that makes it worth the trip. It's always well organised and easy browse. If you're looking for a great range of different things, dirt cheap prices I'd recommend the Citipointe OpShop in Rosemary Street. CONNECTED Shed 4A 143 St Vincent's Road VIRGINIA. and today(Saturday 6/7/13) is a $2 day from 9am to 3pm.